Well-cooked soy beans are mashed into a paste with home-made *koji (rice malt), put into traditional wooden barrels and stored during the changing seasons and natural rhythms of the year. 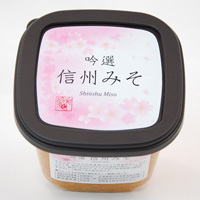 Slowley fermented and matured, this "naturally fermented" miso has a deeply flavoured traditional Japanese taste. Made with rice and soy beans, with added salt. The matured miso is packed as it is, so it is very sensitive to temperature changes. Once opened, we recommend it be kept refrigerated during warm weather. *Koji comes in various forms, including rice koji, barley koji, and bean koji. It is best described as steamed rice or soy beans that are fermented with Aspergillus oryzae, a mold that transforms the grain into sweet, fragrant koji. Japanese foods have been developed over the centuries using koji. It is used to make popular foods like soya sauce, miso, and sake. -Miso can be whisked into dressing, made into soup. Make dashi (put Kombu into cold water and wait for at least 30 min. Slowly bring to a boil over medium low heat, skimming the surface occasionally. remove Kombu and make it boiled. Just before boiling (you will see bubbles around the edges of the pan), remove the kombu and keep it for "Niban Dashi" (see Note). If you leave the kombu inside, the dashi will become slimy and bitter. Turn off the heat to let the dashi cool down a bit. Add the katsuobushi and bring it to a boil again, skimming occasionally. Once the dashi is boiling, reduce the heat, simmer for just 30 seconds, and turn off the heat. Strain the dashi through a sieve lined with a paper towel set over a bowl. Gently twist and squeeze the paper towel to release the extra dashi into the bowl. Keep katsuobushi for "Niban Dashi" (see Note). Spoon the miso paste into a bowl. Ladle about 1/2 cup of the hot dashi broth into a bowl and whisk with chopsticks or a whisk to mix and melt the miso paste so that it becomes a smooth mixture. whisk in another tablespoon or two of miso paste. Top with green onions and serve immediately.